Why Queen Creek Unified School District? On behalf of Queen Creek Unified School District #95, we welcome you to the Queen Creek Schools and our website. The Queen Creek Unified boundary area includes the Town of Queen Creek and extends north of Mesa Gateway Airport to Warner Road and east to Meridian Road. The district encompasses 46 square miles. Our goal, as a district, is to provide a quality education with the belief that all children can learn. We are proud of the comprehensive pre-k through 12th grade academic programs we offer to meet the needs for all of our students. We have quality programs in regular education, gifted, special education, and early childhood, as well as career and technical, and alternative high school services. We are a growing district of approximately 7,900 preschool through 12th-grade students and we are very proud of the high standards of achievement our students and staff have attained. QCUSD students continue to score well above the state average in all areas of math and English language arts. Queen Creek Unified School District empowers each student to achieve excellence in all pursuits and lead with integrity. Queen Creek Unified School District supports the development of the whole child by modeling positive academic, social, and emotional learning through an innovative and challenging curriculum. Learning is maximized by empowering the community, and its members, to partner with us to create safe and secure learning environments for all students. Queen Creek Unified School District expects their students to be successful, compassionate, and productive in their learning so that the next generation of ethical citizens can lead our community both locally and globally. Inspire all students to meet or exceed annual, individual, and academic goals. Prepare all students for post-graduation opportunities, responsible citizenship, and competition in a global economy. Empower each student with skills and tools that support being a confident, resilient, and healthy individual. Teach kindness, respect, and integrity. Provide opportunities that result in meaningful connections, resiliency, and coping skills. Raise awareness of mental health. Enhance diversity related educational opportunities. Value and support all personnel. Recruit and retain highly qualified, diverse personnel. Maximize purposeful professional development to empower personnel. Encourage new and innovative ideas that foster collaboration, efficiency, and growth within the work environment. Increase partnerships as a way to build mentoring opportunities, internships, and community business involvement. Communicate effectively to promote involvement and maximize opportunities for collaboration with all stakeholders. Ensure transparency by providing information used in the decision-making process. Optimize use of funds through fiscal responsibility. Strategize use of resources through balanced planning. Manage district systems efficiently through key performance indicators. Continuously improve facilities and technology. We believe that all persons have inherent value and should be treated with dignity. We believe that learning from success and failures creates opportunities for growth. We believe the pursuit of life-long learning is essential for personal development and community growth. We believe that every individual has unique and valuable strengths and perspectives. We believe that trust is vital to develop and maintain healthy relationships. We believe that every individual has the power to affect change in their lives and community. We believe that decisions are best made when all voices are heard and considered. We believe that every person needs to feel safe and the responsibility to ensure safety belongs to every individual. We believe that character development is a partnership between individuals, family, school and community. Queen Creek is a suburban community in the central part of Arizona. Our town has many amenities for growing families and is a short commute from the Phoenix metropolitan area. We’re proud of our small town feel and family atmosphere—a place where you know your neighbors by name. Queen Creek School District consists of six kindergarten through 5th grade schools, two 6th grade through 8th grade middle schools, and one 9th through 12th grade high school. Our enrollment is approximately 7500+ students. We offer a quality educational program with our top-notch educators and support staff. Our students continue to exceed state and national score averages on their achievement tests. We are dedicated to providing a challenging learning experience for our students in a caring, supportive environment. Queen Creek is a great place to be! The town of Queen Creek is rich in history and tradition. From our namesakes—the Silver Queen Mine and Picket Post Creek—to our agricultural ties to the land, Queen Creek still retains the small town, neighborly atmosphere for which it was famous. 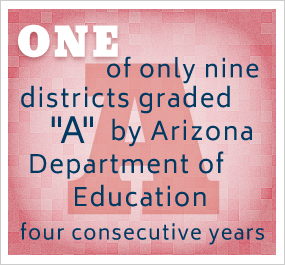 We are proud of the many programs we offer our students and families here in Queen Creek. Our schools have a reputation for educational excellence, and our state school labels prove it. The town of Queen Creek dates back to 1912 when families moved to this area to utilize the fertile soil for farming and when mining in this area provided jobs for many homesteaders. The name “Queen Creek” is a combination of names from Pickett Post Creek and the Silver Queen Mine, which operated near Superior, Arizona, in the early 1900s. The creek originated at the base of the mine and flowed down the mountains through our present day town of Queen Creek. The creek is now dry, but our town has plans for keeping the history of this open space and using it for future recreational trails. Although our town dates back to 1912, it wasn’t incorporated until 1989 when population growth hastened much needed change. Queen Creek currently has over 24,000 citizens but still retains its small-town feel and charm. Queen Creek Unified is fortunate to have the support of a host of partners from business, civic, social, philanthropic, and education organizations that help provide opportunities for more than 7,000 students on an annual basis. Whether on a district, school, or student-level basis, community involvement is essential to our district’s continuing improvement. Queen Creek Unified strategic planning initiative has established priorities with input from all stakeholders. Strategic planning is a way to bring the community into a process that sets the focus of the school district over the next few years. Queen Creek Unified has partnered with the following organizations to provide staff and students the opportunity to contribute to our community: Feed Our Starving Children, Bench the Bag, Buddy Bench, Relay for Life, Jump Rope for Heart, and House of Refuge. In addition, the staff and students are involved in canned food drives, fun runs, Christmas angels, and toy drives. These initiatives bring together many partners to offer a range of opportunities and support to children, youth, families, and communities. Our partners work to ensure that parents and community members are involved with their local school, and that students enter school ready to learn and graduate as capable learners, workers, and citizens. The Queen Creek Schools Education Foundation (QCSEF) partners with the community and businesses to promote excellence through leadership in education. We encourage responsible citizenship by supplementing financial support for growth and learning opportunities to engage and empower our teachers and students to excel academically through grants and scholarships.